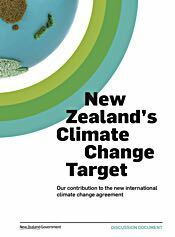 New Zealand’s Climate Change Target: Our contribution to the new international climate change agreement, the discussion document produced by the Ministry for the Environment to accompany the consultation process, is in my view misleading and misguided. It presents a distorted and unhelpful view of the dimensions of the challenge NZ faces. In order to arrive at a pragmatic understanding of how NZ’s domestic policy settings on greenhouse gas emissions should be adjusted to best align with a solution to this huge global problem, it’s necessary to consider the scientific and geopolitical context. NZ’s policy solutions should flow from, and work with, our best understanding of the science that underpins the need for action to cut emissions and to stabilise and reduce atmospheric CO2 loading. NZ also needs to consider the direct climate and strategic risks it faces as a result of inevitable climate change and design policy that limits those risks and increases resilience to them. Evidence from studies of past climate conditions suggests that the last time atmospheric CO2 stood at 400 ppm — 3 million years ago, during the Pliocene — global sea levels were around 20 metres higher than today, and global average temperature was 2-3ºC above pre-industrial (the global average temperature of 200 years ago). As atmospheric CO2 continues to climb above 400 ppm, the only practical question is how long it will take the ice sheets of Greenland and the Antarctic to melt. It may take hundreds to thousands of years to see the full extent of the sea level rise implicit in current CO2 levels, but it’s worth noting that for every 1 ppm we add above 400 ppm, we add to the warming and the final amount of sea level rise. We have already committed future generations to a world with radically different shorelines. We are already heading for substantial warming and increasing damages from climate change. At this stage there are no plans to progress the proposed NES. The Minister for the Environment has made it clear that current guidance provides local government with both the information and the flexibility to plan locally for rises in sea levels. An NES on sea level rise would have simplified sea level planning for local authorities, who currently may choose to rely on “guidance” provided by the ministry, based on work by NIWA. This currently suggests that authorities should allow for 0.5 m rise by the 2090s, and that they should consider the impacts of a 0.8 m rise in that time frame. There are two major problems here: the current guidance numbers, first published in 2009, are increasingly out of line with the latest research, and the lack of a national standard means that climate sceptics can waste time and ratepayer money by forcing planning authorities to adjudicate on their minority views.